I have multiples ice server instances located behind a glacier2. I would like to let a client directly connect to an ice server through glacier2 (kind of bypass glacier2 routing). If a server has an endpoint that is publicly accessible, a client can use that endpoint to connect directly to the server. Servers generally aren't aware of Glacier2 anyway. If that didn't answer your question, please provide more details on what you're trying to achieve and we'll try to help. i mean how an client Identified an request send to which ice server? my ice version is 3.6.2.
i hope all connections through by glacier2. client A1/A2/A3 's request send to server A.
client B1 's request send to server B.
client ABC 's request need send to all server . how can i config glacier2 conf(router?) and client conf (or code ) to do this. 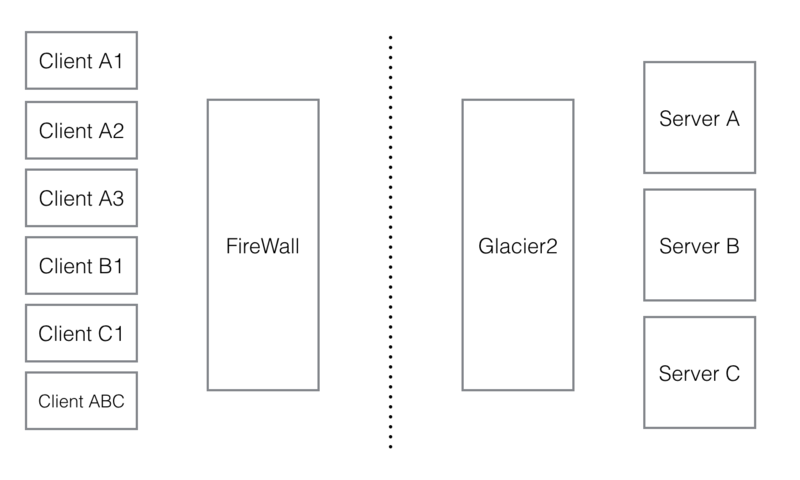 Your Glacier2 client should specify the endpoints of each of the servers for the proxies to Ice objects from server A, B or C. If the Glacier2 router is correctly configured on the Ice communicator, the requests will first go through the Glacier2 router before being routed to server A, B or C.